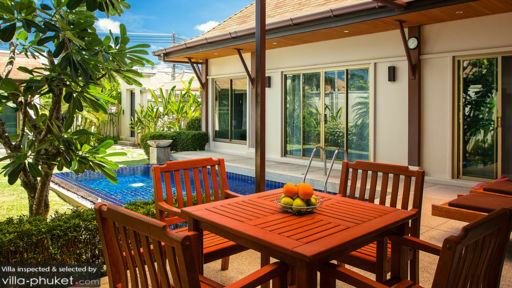 Situated in Phuket, Thailand is Villa Balai: a three bedroom tropical haven perfect for those that want to have their own private sanctuary near a number of Phuket’s beaches. The villa has clean, cosy, and relaxing interiors and a lush outdoor garden where you can spend the whole morning in. The villa is also near a number of restaurants and amenities that make it a convenient yet private area for you, your family, and friends. The master bedroom is a clean and bright space with east asian inspired designs where couples can relax in. In the middle of the room is a comfortable canopy king size bed where you can get a full night’s rest. The room also comes with a wooden study table and cabinetry. In the mornings, you can enjoy breakfast in bed while watching some TV. The master bedroom also has an en suite bathroom with a beautiful blue tiled tub that overlooks the pool. There are two guest bedrooms in Villa Balai. Each of these bedrooms has a comfortable king size bed in which you can get a full night’s rest in. These bedrooms also come with an en suite bathroom where you can bathe in privacy. 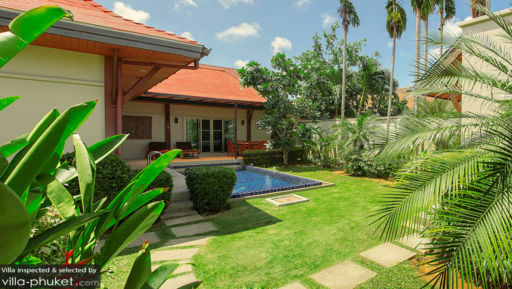 In the lush green garden of Villa Balai, guests can truly relax and unwind. Lay back on one of the two cushioned wooden sun loungers while sipping on a fruit juice. When the afternoon gets too hot, you can dip into the 8 meter pool for a few laps. Lay on your back, admire the blue sky above, and enjoy the peaceful atmosphere of the garden. In the evenings, you can dine in the outdoor dining space, which seats four. After spending most of your morning out in the garden or by the pool, come and lay back on one of the cushy sofas in the lounge area. Here there is also a flat screen LCD TV encased in an east asian inspired wooden cabinet. Whether you are enjoying a TV show or lying back and admiring how the light streams in from the glass sliding doors, it is a comfortable space you can unwin in. Behind the lounge area is the kitchen and dining. In the dining area, there is a sturdy wooden table and four rattan chairs situated in the middle of the fully equipped Western kitchen. Here you can create delicious meals for the whole family to enjoy. Wherever you decide to spend your freetime in, you will be able to have a relaxing time here in Villa Balai because of this open-plan living space. The staff here at Villa Balai are determined to help you have a comfortable and memorable vacation. Upon arrival, you will receive a welcome pack. Throughout your stay, the housekeeping service will ensure that the space stays clean for your use. There is WIFI throughout the villa so you can still stay connected or check your bookings and other itinerary details online without worry. 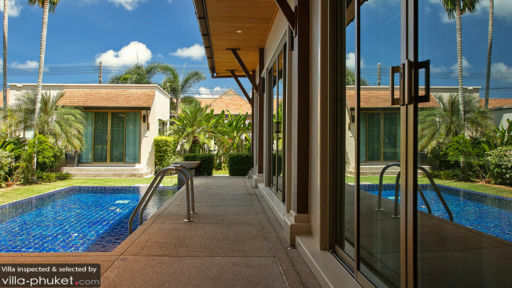 Villa Balai is situated in Phuket, Thailand just a three minute drive away from Nai Harn Beach, which is a popular spot with a few hotels in its vicinity. Here you can lay on a soft towel and watch the waves kiss the shore. You can also grab a drink and admire the sunset in one of those hotels nearby. If you do not want to venture away from the villa, there are restaurants offering various cuisines within 3 minutes walking distance. Within the vicinity is also a Family Mart, massage area, and gym.